Thank you. I wish we had taken this class earlier. I will be a better parent and co-parent from attending this class. It brought to my attention that I have made many selfish mistakes and need to change. It also allowed me to identify that some things I said and thought I was doing for the kids, I was really doing for myself and they would actually hurt the kids. This class is amazing!! It made me feel more optimistic about coparenting. I enjoyed learning about the different alternatives that can be used to try and modify and change the situation. The presenters did a great job and appeared very knowledgeable about the topics presented. I plan to utilize the information and hope to change things. I thought the class was very informative & I really like the info about the alternative methods to joint parenting. This class helped deal with and settle issues with co-parent. The attorney and Judges should make this a requirement before litigation. I loved the course & the interaction. You guys are too funny & I got some great laughs today. I learned so much more than I already knew. I was considering court but now I would like to find an alternative. The course was informative & somewhat entertaining & humorous. Should be required for all parents. I wish I had been told about this class sooner, I wonder why attorneys don't tell us about this class until after we paid them and until after the judge orders it (sarchastic roll of the eyes). I know you said many atorneys do, but ours certainly didn't. I've learned so much and after we both took Part 2 last week we decided to meet up to create a parenting plan. Thank you! I have seen several co-parenting plan outlines and tried to figure out how and why they could work before I came to this class but I didn’t really understand. Pare helped me understand this tremendously more. I have confidence I could go home and do this now. Also, I LOVED the Arlington/Grand Prairie analogy and she did an excellent job presenting this in a way I could understand. Excellent class & very well presented. Particularly liked the concept that kids should be able to let their guard down @ home & not be on edge. Also, really liked the emphasis on reflective listening & need to build a solid foundation via consistency & continuity. 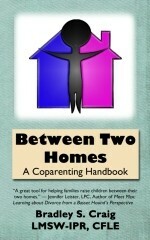 Also gave solid, concrete tools (co-parenting plan & list of examples of Do/Don’t do) to execute better co-parenting. Instructor was very knowledgeable of material and of different situations that may come up. I really appreciate the time and passion. You make a very difficult issue more comfortable. Very inspirational. A lot of material hit home. Very factual based material. Excellent class-learned a lot about myself. Very informative course. I would recommend this course to anyone who is raising a child in separate homes. Instructor was personable and communicated with ease. Awesome Job! Excellent course! Had no idea that I would gain as much knowledge on such a wide array of subjects. The presenter is very knowledgeable and speaks clearly. She helped me undertand things I didn't know. I was ordered to take another class in Dallas for our divorce which I thought was boring and it certainly did not help us settle. So I was really upset at our modification hearing that the new judge ordered us to this class. But after taking both parts of this class, I'm so glad she did. I got way more out of these two classes than the one I took in 2011 and I really see how we could have handled things differently and the mistakes I have made. I filed the modification, but now I want to see if we can work this out between us. Very good instructor. I feel like I left today with a different mindset about my current situation. I believe anyone going through divorce/custody issues should take this class. It is a huge help! K.S. I am very glad to have taken this class. So much new and different ways to better myself as a dad. Brad is an amazing teacher and the material was delivered in a very entertaining and appealing format. Thank you!! B.C. Awesome Class! Thank you so much! I really needed this. With a 1 yr old it's amazing to learn all of this before she is older. So this class will definitely make the future easier. THANKS!! This segment of the class was the most informative and helpful in dealing with my situation. The best interest of my child will be my top priority. Thank you for the great presentation. I am ashamed with myself. I was always so focused with the other parties negative actions, I was doing so many negative things myself. I will focus more on being a person my child loves to be around because I am positive. A.N. It's funny for me to hear all the "dont's" and realize my parents did all those things. After hearing those decisions were wrong it opens my eyes that I was not wrong to feel the way I did as a child. It is like a relief to know that I know better and I will not make the same mistakes. Great information, things I"ll remember that will help me to have a better co-parenting relationship. Great class-time flew by- Really opened my eyes, mind, heart to the real feelings about children in the middle. C.K. Again, I’m glad I attended these classes. They have definitely opened my mind more about my situation. I thank you, I think your doing a wonderful job. And I’m certain now the choice I’ve always thought was the right one, is definitely the right one. C. T.
I wish I had known not only about this class sooner, but also all the options that are available instead of constantly fighting in court and dealing with that stress. The class was very informative and was presented in an easily understood manner. The video clips from the judges and children shed some light on my personal issues. I look forward to part II- I saw myself in some of the information/descriptions and my spouse in others. I hope he will be receptive of the information as it is presented. Thank you! It was much more emotionally difficult than expected-but that’s good! I’ve learned a lot today. I hope my other party comes here too, so we can be on the same level to raise our daughter the best that we can. A.N. I didn't want to come to this class, and I just want to say I’m glad I was ordered to take this class. It has brought light to a lot of things I’ve been pondering. It has really made me think about all of the aspects of my situation, and I’m seeing a lot of things a new, better way. I’m glad I spent 3 1/2 hours listening to you. C.T. Glad this class is offered in Collin County. It was very informative and entertaining. Thank you! C.H. I enjoyed the class very much and it gave me a lot of insight on what to expect. I think this class is wonderful. It can help you a lot in many different situations. The instructor was very helpful. Thanks Children in the Middle. I think this class can help anyone in these situations. I'm very happy that it came because it gave some pointers in my situation. Thanks guys! The class has really opened my mind and eyes to get a better relationship with my children. Perfect real home-hitting references, discussions, and solutions encompassing and recognizing personal situations and realities. It is time to "grow up," be respectful of one another, and stop the blame game for the children. K. B.
I really dug the class. It helped me see other people's positions and how they're "supposed" to act towards and with the child. It is a good program. It should be included in high school curriculum. It think every family with children should be required to take these classes before filing for divorce. S. B.
I feel a lot of this information I know, but it helped open my mind to more information and other ways of thinking of what I know. K. B.
I wish I had known about this course when I was first separated. There was a lot of great information. Thank You! L. T.
Why isn't it required that coparent classes be taken when a divorce is filed? Do this before you get too deep into the litigation path. We are the grandparents of a 5 1/2 year old...many of your examples have really hit home in our situation. Great info!! I wish that there was another couple of hours for discussion/group therapy. J. P.
Keep up the good work! You were informative and kept our attention. I know that you have made a difference in other's lives. Brad presented material very thorough. He answered question I had as far as mediation. The information was great. I am going to attempt mediation. I want to coparent for our daughter's best interest. The humor really helped solidify the information. Also, the two team approach made the time go by a little easier. Very good course, needs more time. Wealth of information learned and prior mistakes will be past history as far as what not to say to my child. Eye opening how little seemingly harmless questions or behavior are undermining to a child. Again, thank you for your passionate presentation. Great Job! Fantastic course, I agree totally. I really wasn't looking forward to coming to this class. But as I sat through it I realized that it was very helpful and I think all divorced parents should have to take this class. I am glad both parents have to attend this class, because sometimes we don't always realize what we are doing. I know that I am guilty of some things in the past that I didn't think was hurtful at the time, and so has my spouse. Negative comments, etc. Thank you, kept me awake! Bravo, Great class-very surprised. Thanks again. K. S.
Great class and info. Excellent presentation. C. S.
Again, my ex has said he will not take this course, even though he was court ordered. I think it only helps if both attend! Good course, very informative. I came in with a very negative attitude about this course, but found it very, very helpful! J. H.
My choice of words or the manner in which I make statements could be better worded in some cases. R. S.
Yes, this class has really helped and opened my eyes and mind. Very well presented. Hats of to you Brad. I enjoyed the class and it actually made me feel a little better about my and our child's situation. Very well done- Topics great! This class helped me learn a lot about helping my child feel that they have two homes and that we need to meet the child's needs first. Thanks! You are a great speaker. I really enjoyed your classes. I have learned a lot! You are a great instructor. Excellent presentation skills. Not bored even a second. I hope the other parties take this course. Liked the knight in shining armor and the stages of grief presentation. Brad, you are energetic. Good imitation of examples. Passionate about your subject. Came here thinking it was going to be a drag. Quite the opposite, very refreshing. STAY PASSIONATE. Thank you. J. R.
I've been separated since 1996, we have 3 kids together. Now that we are getting a divorce, this course provides options that I can use to work with the kids mom for our kids benefit. Good use of media (TV) with live presentation. I enjoyed part I much more than part II. The mechanics of the rescuer-victim environment that we need to grow out of these dysfunctions was most relevant. To me it leads to the ability to forgive and allow the children's interest to be the prime objective of the parent' discussions. Some of the information needs to be available to people on the front end of entering in to a relationship. The problem is most of us are only exposed to these concepts and principles when we are in the middle of conflict. This is truly a shame. C. B. Great class. I think every parent should take this class even if they are not going through a divorce because the situations usually happens even in the family that is not divorced. I enjoyed these two classes. You gave me some excellent advice and information and knowledge. Thanks. You did an excellent job presenting these classes. What a fast speaker! The money I spent for these two classes was worth every cent for the vast amount of information. Thanks again! Information given out fast and it is good-positive information. J.W. Very good presentation and realistic examples. This course has been very beneficial. Made me think about psychological effects upon child and potential long range effects certain actions may have into the child's adult life. Very informative and will aid me in becoming a better parent/coparent. Target specific. Want more info. on pushing buttons. I learned a lot and I am looking forward to class 2. A.
Brad seems to be very knowledgeable about this and I learned quite a lot at this first session. T. G.
I wish I would have known about this class sooner. I will suggest this class to others. I enjoyed the stories and was able to relate them to my situation. My wife needs to come. It was very clear and helpful to me all the things you showed me. This class was a big help! I learned a lot. Thanks. Very informative. It has changed my perspective on standard visitation. Very informative, made me think about my situation completely different. Thank you! Class was very informative and helpful. Good resources and ideas for direction to go next. A lot of information was given - some things were explained that I now understand better - it all goes back to the child - the child must be first - it is all about what is best for the child. R. W.
I took part II first - I have already recommended the class to my parents. Thank you for good information that I know has changed the way I operate. I believe if my former spouse will use the lessons, we are on the road to recovery. This class has informed me greatly. I am the stepparent and would be willing to help both parents try to agree on things outside of the course if all parties would utilize this information given from the course. The father and mother definitely need to find a place where they can meet in the middle. I believe they could do it if they both put their differences aside. I agree that it would benefit for both parents to attend the class together. You should include this on the recommendation. I wish this type of class had been available when my parents divorced! I truly hope the folks attending this class will pay attention and make changes. I enjoyed this 2nd part of the class. The instructor presented his information really good. I tried to put myself back to being a child and now I will remember how I felt when I am around my children, when things happen. Thank you so much for having this class. I really enjoyed this class. It was very helpful for being a stepmother of three children. I feel I can take a lot of the information that I learned and help better the relationship between the kids and their parents. I truly hope their mother will come and take the knowledge I have received and apply it. This class, I believe, will help make me a better stepmother. Thank you! This class has taught me a lot of life long lessons-not just pertaining to parenting. Instructor was wonderful and brought a lot of things to my attention. I now know in order to do what is best for my kids, I need to get past my anger and work for the kids. I can and will be the person to step forward to get the ball rolling. Thank you! L. R.
This class helped me out on how I can help my children through our separation. I think every parent should take this class. Great information! I wish I'd heard about this class when we began having trouble. I'm going to suggest my children's mother take the class as well. We should be able to work together and I believe that this class can help us do it. Personally, I know the information will make me a better dad for our kids. J. S.
I am glad I attended this coparenting class. It showed me how to talk to the grandparents. It also helped me to deal with our situation in a better way. The program helped me. I hope the grandparents go to the same class, because it helped me a lot. J. W.
Attorneys should recommend this before initial appointment. Should happen before temporary hearing. Great class, but with all the information it needs to be longer. Examples were great. I don't have my own children so some of the examples made me see what I need to work on. I was trying to put a time limit on him fixing the 5 year old from trying to sleep with him. I learned it needs to be fixed at the other house. She is used to sleeping with her stepsister so of course she would not want to be by herself at his house. It's the little things you don't think of. ...I did appreciate the way Brad led the class and encouraged our participation. Too bad we did not know about CITM a year ago; it could have saved us all a lot- for what you do, thank you! I had coparenting w/ Barry Coakley and benefited greatly. This course (the Children in the Middle course) was fantastic for just 2 days. My evaluation is also based on having the training before. Thank you so much. Appreciated referral to other resources. Really like "time of responsibility" instead of "period of possession." This class is full of so many options for resolving conflict. It's too bad that this class is not mandatory to take before being able to file for divorce or before a court date will be set. Excellent presentation. Brought up issues that I was not aware could be a potential problem. I might be beneficial to have an extra 30 minutes to the presentation just to ask questions. You are a very good speaker and keep it very interesting! You did a great job and I like your past experiences. Thanks! I feel this coparenting course is very helpful and should be recommended more to parents. This class is wonderful. I have learned so much about how my children see things. I t will enable me to change my ways. A very well taught class. Helped me understand more about this stuff. I look at a lot of things different now. I sure hope my wife gets the same presenter that I did. Thanks. J.G. I enjoyed this class and look forward too part 1. Mr. Craig has a wonderful teaching style. Meets needs of all types of learners. Class was very "eye opening." T. B. Very informative. I wish I had known about this class earlier in the game. Didn't want to come, glad I did. J. G.
Makes me feel better about the future of my ex-wife and children. Opened my eyes. I thought I was being fairly reasonable and consistent in my requests and expectations concerning our daughter. I now realize that there our many other avenues that I need to explore. Great class! R. H.
Very informative to know or realize that the spouses (parents) can control the situation and not give the courts or attorneys ultimate responsibility that affect our children. I really learned a lot of things I did not know about going through a divorce. After tonight I will and going to change the way I look at things and our child. Helps me realize a lot of my anger towards my parents and things to do to change so my children don't feel anger about me. A. S.
Enjoyed the presenter- wish there was more time to discuss examples. Talk a little faster :) Actually, your presentation was perfect, the speed kept it from being boring. I hope our children's mother attends. R. W.
Thank you to get me some idea to deal with the other parent. S. C.
I want to thank instructors about information I got. S. C.
Was very pleased with the course and thought the information was very helpful. Really helped me to understand a lot more of what a child really goes through or even how they truly feel. Outstanding presentation, wish I'd been instructed to attend earlier instead of waiting. It could have saved a lot of heart ache...and money. Mr. Craig instructed the class very well. I learned stuff I didn't know and will benefit from this class. I've learned that me and the other parent have to look at our children's needs. We have to communicate because we don't and I didn't realize how important it was. Thank you for giving me insight on what "everyone" who is going through a divorce might be thinking. Very good speaker! Good knowledge. B. Z.
I think this was great. I learned a lot. I hope and wish my wife learns something from this course also. Full of useful information. I see more clearly where mistakes are made. This class was AMAZING!!! I will take it every 3 months to refresh the topics to stay on top of the lesson as long as Mr. Craig teaches it... J. A.
I like your personal style of presentation. Your stories and comparisons were very helpful. Thanks! Helped me see what others was doing wrong and reinforced me. Good job. The class moved along quickly. I never have intentionally involved the children in what's going on nor talked about it in from of them. But I have intentionally done things that could be considered alienation of another parent and this will stop. My needs don't supercede the children's and I have put my needs first and convinced myself it was for the kids. This will change. Thank you. I took class II first but feel this would have been better to attend first and early in my divorce process. Enjoyed the lecture. Material was helpful. I enjoyed the class and do recommend this program to families. Good information. I will do everything I can to stop litigation and resolve the coparenting issues with my wife. Great class. I appreciate the honest responses. The class peaked my interest in learning more about how the divorce process affects children. Thanks for letting me see my child's point of view. Outstanding presentation; very straight forward. This class is helpful. I have been at it twice now and have learned something each time. Some of the information is common sense, but I realize it is not always followed. Very positive-new and improved ideas on dealing and handling the situation-I'll recommend this highly!! Great class- I wish I took the class before divorce. I think this class not only for divorcing families but for all family members so that parents have better view on parenting. Good class. Helped me see I am trying to do what is the right thing for my husband and our child. Thank you. "Thanks", you opened my eyes to some of the situations I have been in and how I have been reacting. I'll try to do better. Video's were very good. Professionally done. Good information. You held interest during the whole period- good presentation skills. Really like watching the kids responses to different divorce situations. The class has helped me realize things I've done wrong and things I've done right with respect to the children. It was positive how you represented all sides and didn't spend to much time on one opinion. Some info. was a real reality check. Most of it hit close to home and is closely related to modern topics. This is a great class! Needs softer chairs, everything else was great!!! Thank you. J. C.
Exceptional class. Wonderful. Great. I needed class years ago. Thank you! I enjoyed your humor because this time is tough enough. Humor helps. Thanks. Grandparent-The humor made things more relaxed. Connected the behavioral dots of personal behavior and how it can affect the children involved. Great presentation. You are very knowledgeable about your topic and your passion for families shines through. I found the class informative and the fast pace kept my attention. First time speakers have made so much sense and so clear. I feel I have gained a lot of insight by taking this class. I will now know what direction to take. Thanks! I felt like most or all of your examples was my wife's mind set, I realize I need to change my reactions to her actions. Thanks. Good job! You both do an awesome job at presenting this information. Needs to be given before marriage. Class was common sense, but is something that needs to be reminded to parents again. It was also helpful from the view of a stepparent in a coparenting situation. J. W.
I wish this course would be mandated to all parents who are divorcing so as to change many behaviors before they become problems and cost lost of money in litigation. I wish someone had recommended this course 2 years ago before we got this far. Very informative. Thanks! This helped me realize no matter what the child's well being comes first and parents must communicate amicably. Good class. Thought of things I hadn't thought of before. I do look at what the best interest of the kids are and I do many things you talked about, I will do better for the kids. Thanks for 2 great classes. What a great class! I liked all the analogies and stories. Thanks! I leave with a lot of info. to think about to strengthen my coparenting skills. :) Mr. Craig is extremely knowledgeable and utilizes the 3 hours very efficiently. I thank you for all the information you have given me. You know my ex husband took this class first and it looks like he became a different person because this helped him to focus only on his children. Now it helps me to agree with him on our issues. M. F.
Speaker was very good speaker. I learned a lot from the coparenting class. Thank you. The class was really informative. D. M.
Learned a lot, and fun! Not what I expected. Both presenters were very knowledgeable and provided many examples of what to do and not to do. They also incorporated humor and human factors in their presentation. Good class. Needs to be a little bit longer. Good information. I feel I have learned that I can respect my two daughters, and understand what they are going through. I hope the mother of my stepson attends this class. It really is beneficial. My husband has decided to drop custody pursuit and has been much more cooperative. We are focusing primarily on the kids now. J. R.
This class was very informative. I wish that this was brought to parents attention when they first entered into court. We settled in mediation after every avenue the court offered a year and a half later. Thanks for the information. Should advertise this class to help coparents work things out without losing so much money. Very good class. Very informative. Really good class. A lot of information. It would benefit both exes for them to attend the same class at the same time. A big help. Thanks. I think it would be beneficial for both parties and all involved to attend same class, same day if at all possible. That way same info. same instructor. Great job! Very informative, offers insights and solutions. Very Helpful. I understand why you speak so fast. To get all the information out to us. I think the class was great... D. M.
I wish my spouse will take this class. I really enjoyed the class, and I will take some of the suggestions and implement them in my home. The class really made me think. Thanks for a great class. Facilitator was very knowledgeable and presented subject matter in a professional way. I appreciate all that you have done for others and what you do now as well. Thanks for your enthusiasm and caring heart. Was very knowledgeable with a lot of helpful information. K. G.
I found the course very informative. Will definitely suggest this course to others. I will probably seek more classes. D. C.
Thanks, this was a great deal of knowledge for me that I can use in my situations. Very informative. I enjoyed the class. Thank you. This class really helped me a lot. You all answered all my questions I had. I really enjoyed it. There was many things that I didn't think I needed to know, but I really did. Thank you. I now know that I 've been doing very well. Thank you. I would like to make this class a prerequisite before taking any DMS-mediation sessions. Prerequisite before marriage licenses are issued to every and anyone. Very educational, I will suggest my friends and people in the children's life to take this class. Brad, this was a fabulous class! I wish it had been suggested originally. We will be back. I hope we can come to a united front, M_____ deserves it. M. N. J. This guy was fantastic! Great communicator, great orator, one word AWESOME. J.T. The nest egg story really helped me to look at myself. Very helpful, changed my thought patterns. The course was very interesting. I wish my other half was here, it would help. Liked hearing more about the role of the mediator. Excellent!!! Walter and Brad are excellent on the child's subject. Especially with the views of other people not saying things about the other parent in front of the kids. They made this course enjoyable. J. F.
Great course- wonderful insight into feelings, situations, actions, and reactions from a child and parent's perspective. I need to put all of this great info. into action. I wish I could have know about this class before we have put our kids through this mess. V. R.
The course gave good information. The class was very helpful and made me realize how important communication is between me and the father to best benefit our child. Very thorough, good explanations on topics. Reminded me of how my mother used me to get back at my father. The child is 17 years, he will be 18 in 5 weeks. This course is great for people with younger children or couples that have never gone through this before. It would have helped if we had this at the time of the original in 1987. This course would have helped the situation over the years that developed. S. C.
Although our daughter is only 10 mo., I found Part II very helpful. It made me realize that some things I thought I was doing out of love weren't the best for her. It helped reinforce what I knew was right, but had ignored. I volunteered to attend for support of my husband. However, I have two children whom I have custody Their father lives in Florida. This really helped me to understand the 5 stages of grief that can repeat during different times in their life. It also helped me to feel good about how their dad and I have been communicating even though he's a distance away. N. P.
I really liked and learned a lot from this class. E. P.
This class encouraged me to be more objective about our situation. I'll be easier to work with because of this class. This is an exceptional program. We all are graceful - your "vision"...now impacts the improved quality of life for our children. I'm very glad both of us had to attend this class. It will help me realize our goal because sometimes it gets lost in the fog. Hopefully she will recognize me a his father and want to work with me. I am happy to get the information about alternate forms of resolution. Le. R.
As a grandparent who is dealing with a daughter with a drug problem-the victim part opened my eyes. I truly thought it was something I did. This class just helped me strengthen our resolve to worry about the child (our granddaughter) & let the adult (our daughter) worry about her problems. The co dependent information was very interesting. I also liked the story about beautiful baby Bobby. This is definitely what all divorced parents and stepparents need to maintain healthy relationships. N. P.
This class was very good and helpful. D. P.
This class was unbelievable. I am speechless. I have learned so much and feel like a different person. Mr. Craig, this was just great. Thank you! M. S.
I know it is better to work together-put your pride and uncomfortable feelings behind you. The children are such a gift, don't throw it away. You only get one chance to do it right. Put the time and money back into the child's life. Learn to forgive before it's too late. M. G.
I thought that this class was very educational and even went by faster than I thought, thanks to you. I admit I was pissed I was ordered to attend this class. But this was awesome! We are back for one of those modifications you talk about and we actually attended another course like this in Dallas when we were first divorcing. It was nothing like this and I wish we'd had this class back then. This was way better and actually motivated me to change. I just hope she comes. Great class! I agree whole heartedly that mediation or other forms of communications are best. I can't wait till part II comes around. After 17 years of divorce, this class was helpful to know where each of us did wrong. A course like this should have been offered earlier in my situation. It is something that is needed by parents. He did a really great job. It was very informative and I learned about how to appropriately work with the children. My divorce started 21 months ago, I wish I would have been advised to attend this course back when it all started. Very informative on helping make coparenting choices. I'm glad I attended this course. Gave me a different view on some of the choices I have made. This class really helped me notice that you and the other parent need to reconcile differences and do for the children as needed. Always look at things form a child's point of view. I enjoyed Part I and Part II. Unfortunately the father I chose for my children turned out to be abusive and mentally ill so it will be a long time before I can coparent with the children's father. I am hopeful that when the courts say he is rehabilitated we can successfully coparent. At that time I would like to take this course again for both of us. I also took the ****** ordered by Dallas County and I prefer this course. I appreciate your enthusiasm for the subject. This class was very informative and the instructor presented in a way with many examples that everyone in the class was able to benefit from. Excellent class! Learned how to cope with my situation the right way. Don't have the anger I came in with. D. L.
I found this class to be very informative and the speakers were knowledgeable of family issues. I appreciated the fact they actually work providing custody evaluations and directly with the courts. I was very impressed with the facilitators professionalism and candor. This type of class should be mandatory once the divorce is filed rather than waiting after it is final. Great class! A. O. This was a very helpful & informative session. I feel this will help my ex-husband and I make two good homes for our son. Every adult should take this class and we should also educate our counselors in the school system by having them understand some of our children who are facing divorce-separation, etc. I also think all attorney's should take this class too. If their sending their clients, (if their not, they should). R. C.
The course showed the children's views very well. Learning the correct words to say is very helpful. I really enjoyed this class! I wish my parents would have been required to take classes like this. Life wouldn't have been so hard. Very energetic, charismatic. Keeping positive aspects of situations instead of focusing on negative situations. This was a very informative and helpful course and I can see the benefit it would have for people in conflict...it was a pleasant experience. M. B. The presentation was very excellent. I learned a lot form this class and intend to try and work towards a better future for the two children that I do love and care about. I was a little discouraged about some of the information, ex: domicile restrictions. I came with and open mind and I have been enlightened about litigation. I don't agree with all of it, but I am interested in mediation. R. C.
Talking about a good reason not to move was explained very well since I had no idea why the judge ordered me not to move out of Tarrant County. Thank You. Keep up with the good presentations! I truly enjoyed the class. They made it both informative and interesting by sharing stories. Wish I would have taken this class before this mess got started. Thanx for the course! I learned an extreme amount of information. I wish I had taken this class when I filed. Good info. on parenting plans and communicating with the child and other parent. Very happy I was told and sent to this class. J.H. Class II was just as good as class I. Great view on issues and instructor. I am a fireman for 19 yrs. and I have gone to a lot of elementary schools. There are good points to talk with parents and children. C.L. Excellent presentation. Humor helps the healing. I've learned a lot. I knew that some things were incorrect and didn't want to change. But now see that changing will benefit our children and now hope to be able to work things out for them and not me or him. M.
This should be a required class before parents are allowed to hire a lawyer. I learned a lot and I hope that I can make it work. I didn't know that a course like this was available. Many of your statements are right on target with my situation...you helped me open my eyes to more options of trying to resolve my situation. Mediation information was helpful. Very informative class. Changed my point of view on my modification case. Incorporating the video into the lecture was very useful. It helped me understand some of the opinions and the views from the court. I attend both parts of the class and found a lot of useful information. I enjoyed the stories. They really helped me see the child's point of view and new ways to solve our problems in a more communicative and mature way. Thank you! My wife and myself have both taken part I. We now are more flexible and communicating. With our child as our top priority. I can't wait for her to take part II. It is just as powerful as part I. Very, very good. Wish both of us would have done this before we went to court. I saw things that we both have done wrong as well as right. R. G.
Thank you, this class was quite an eye opener on many subjects that I thought I had down good. Very informative on teaching both parents responsibility of caring for the children not just possessing. Mediate, mediate, mediate, I hope. L. G.
I appreciate the information on the mediation advice. It showed me how it could resolve our issues peacefully without the courts making the decision. Anyone with a child or children should attend. "Powerful!" D___ you talk fast! I appreciate your feelings to put the children first, and your enthusiasm towards coparenting issues. This class opened my eyes to mediation. I am going to call my soon to be ex-husband after the class and ask if we can go to a mediator to resolve issues and keep us out of court. I am so Thankful for this class. Brad was an awesome speaker and presenter. Excellent class - made me realize the position I have put myself and my family in. Thanks for your knowledge and experience. I hope it will help us both. Both parts were excellent. Truly made me think in new ways. This class should be mandatory when divorce is filed for. It would help all parties understand the child-related issues. E. C.
I would like for my whole family to take this class so that they will understand when I make the decisions I make regarding my daughter. C. L.
Very good class. I hope this class 2 is just as good. C. L.
I believe that this class gives different scenarios of real life situations so we look at that situation from a different perspective. To be objective and lax so that we recognize that for the rest of our lives we will be involved in some way or another, so we strive to make it easier for our children. I. D.
This class really helped me and I have learned a lot about our child and her situation. Very good presentation. Very good points and how to address problems. P. K.
I wish I had known about these classes/options sooner. I have been involved in litigation for 3 yrs. and was not aware of any of these options/services until 3 mo. ago. The class was presented very well! Brad - Super Job! Excellent video. I see now form a different point of view.. to not look at it in a legal way but a parental way. This class was very helpful. I t helped me to be able to see things more from my child's eyes.. I really needed something to help open my eyes. C. S.
Yes, frustrated initially to be ordered here. Wonderful class, I'm very happy that I was ordered to go, looking forward to part II. J. H.
I believe that the objective overall is to create and maintain a constant security - a real security that our children can feel safe at both places. F. D.
I like the class very much. 1st time on a place like this. I recommended to all couples that have children or about to have children. It's a great class. I learned so much things from this class. M. C.
Great class! Lots of good information... overall I think your class is a great buy and I learned a whole lot. Thanks! W. E.
Excellent course- both parts I and II. I know that I can be a better parent now that I gained new and exciting information. Thanks and keep up the excellent work. This is an eye-opener and very informative for parents going through a divorce. I've been exposed to some of this - but I can honestly say I learned a lot today - especially appreciate your focusing and giving us perspectives from the child's point of view. I learned to try to utilize this knowledge to promote a healthy lifestyle for my child. The class is great. Keep it up. I wish this class was mandatory before marriage. I enjoyed the video that was played. It brought a little closure to my reactions, and actions. T. S.
I feel this class has helped me a lot. Gave a lot of info. that I was just not informed on. I also realized there were things that I was or wasn't doing. Video's and seeing judges on their perspective. Video's are excellent! :) He is a wonderful speaker. Keeps the crowd awake and involved. It was never boring... would recommend to everyone I know. G. M.
Maybe another handout you could add to your packet would be "good ideas." You mentioned at the end of the class - a great example was the phrase "your other home" or keeping clothes at both homes. Very valuable class. Helped me to understand what did happen in court. I would recommend this class to everyone going through a divorce. It really opened my eyes to the different points of view on both sides! I have been divorced six years, and wish I would have been ordered to do this right when my divorce was final. This class made me open up to being a little more flexible with how I should go about getting along with the other parent and come up with our own agreements to certain situations. You made me see that some things I do are really hurting my boys. This should be ordered first thing after divorce is filed. Before anything else is done with attorney's office. Every parent that is fighting with children involved should take this class. Very Helpful! It gives me better knowledge and resources. I was enlightened. I hope my husband will come to this class with an open mind. Excellent information and instructor. Look forward to part 2. The course makes you remember who is important, and remember the statement "best interest of the child." Work hard to get his class mandatory before litigation even starts. It should be ordered for both sides, including stepparents as long as they are a part of the child's life. I feel more positive about my relationship with my kids. I learned that I am much more of a primary care provider than I thought. Outstanding class. Instructor very knowledgeable on a variety of subjects. I really enjoyed the class. Keeps things interesting. Very informative. I believe I came here with somewhat a closed mind and went away with a different point of view. I wish I would have taken this course before I got married. It was fun, fast, and very educating. I feel like this was a helpful class for me and am definitely realizing that my family is hindering us from settling this due to chose to listen to them to often. Thank you for a great presentation that will hopefully help in our case. T. M.
Excellent class-kept me interested! Very down to earth explanations and examples. Y. T.
Thought the way all was presented was very good and detailed. I enjoyed your ideas and plan on putting these into action. Thank you!!! Very good presentation! Hit all areas hard and to the point. Helped me realize what I'm doing now and how I can improve on my wrongful ways. I really am thankful. M. P.
I like the "victim" topic you covered. It is a big topic that some people (me included) didn't recognize. You gave the whole picture which helped me understand the situation more clearly. I think this class benefits EVERYONE, and all parents ought to join this class for the sake of their children. You really helped my husband. He was not very active in our children’s lives. He has made a complete turn around. You showed him ways to be pro-active. I learned a lot of new things, and some of my choices made me stop and think of a new way to handle my situation. Samantha H.
The course really opened my eyes to some of the mistakes I have been making in regard to my children. I enjoyed the class and I feel they look out for the children, and it made me see some things I was doing and made me realize what it was doing to my kids. It made me think abut what my kids were going through. I was really mad about what was going on. Now I know I’m not the only one going through it, my kids are too.